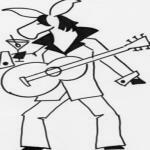 Sign up for Broadjam today to follow Nobody's Mule, and be notified when they upload new stuff or update their news! A love song to a special lady. Musings regarding a love and desire that surpasses surface factors. I don't need your money/Now Baby how you feel about that? I know it may sound funny/But I don't care if you're thin or fat. I just need your lovin'/ Baby how you feel about that? I just want your arms around me/Baby that's where it's at! Baby how feel about that?/Baby how you feel about that? Baby, that's where it's at! I don't need no caviar/Baby how you feel about that? I don't need a Cadillac car/Or John B. Stetson hat. I just need your lovin'/Now Baby how you feel about that? Baby how you feel about that?/Baby how you feel about that? I just need your lovin'/Baby how you feel about that? Yeah Baby/That's where it's at. Baby how you feel about that. A paean to true love in times of fashion. Thanks for supporting Nobody's Mule! Would you like to help Nobody's Mule get heard by industry pros by buying them a song submission credit to Broadjam Music Licensing Opportunities?